Dental veneers have proved to be an easy method to correct both the physical conditions and the aesthetics of natural teeth. Veneers are thin, tooth-colored porcelain cemented to the front surfaces of teeth. When considering restorative options to natural teeth, one must be aware of the facts surrounding dental veneers. 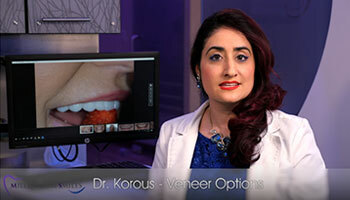 Dr. Korous at Millennium Smiles wants to educate her patients, current and new, on dental veneers as a viable option in restorative dentistry. This post lists and discusses the six major points to consider should veneers be a recommend treatment. Natural teeth will eventually discolor from years of eating pigmented foods; from drinking coffee, tea and red wine, and from smoking. Although teeth can be bleached either at home or at the dentist’s office, the stains will reappear. Veneers will mostly resist stains and will eliminate the need for whitening treatments. Veneers will correct teeth that are slightly gapped or crooked. Although the positions of the natural teeth will not change, veneers will correct the appearance by their attachments to the front surfaces. It is important to know that veneers do not replace any orthodontic treatment. Tooth enamel is strong, but destructible by wearing down over time or by eroding from highly acidic foods, drinks and stomach acid. The price of this treatment is dependent on where you live, your dentist and the number of teeth needing restoration. A survey by the members of the American Academy of Cosmetic Dentistry verified that the average cost of a single veneer is $1,300. Some patients experience sensitivity to hot and cold temperatures for a few days after the procedure. Although uncomfortable, tooth sensitivity can be managed with the appropriate toothpaste and rinse products. Veneers are permanent because structure of the teeth will be changed before veneers are placed. This structure change may involve the removal of some enamel to allow room. Dental veneers are an excellent treatment option to restore discolored teeth and to change the appearance of crooked or gapped teeth. However, it is important to know and understand the facts of the treatment for an informed decision to be made. If you would like additional information on dental veneers to consider, then please contact Dr. Korous at Millennium Smiles, located in Frisco, TX, where new patients are always welcome. Millennium Smiles is trusted and highly recommended for the veneer treatment, as well as other procedures in restorative, cosmetic and general dentistry.